39 West Press, 9781946358066, 180pp. 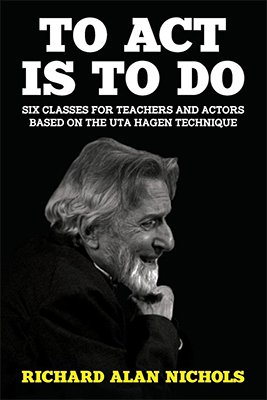 To Act Is to Do by Richard Alan Nichols, who studied as a scholarship student for five years with Uta Hagen at the HB Studio in New York, is the ultimate guide for both actors and teachers. In six informative and interactive class sessions, Nichols details twenty exercises designed to solve most acting problems that arise while working on plays. Also included are eighteen evaluations of work (scenes, monologues, and Hagen exercises) presented by Nichols' students, with each evaluation serving as a model for teachers to follow in order to assist actors in learning how to assess their own work in an honest way. This unique exploration--the personal journey of one actor's lifelong quest to perfect his craft while in pursuit of becoming a player--will help all actors develop the discipline necessary to fine-tune their acting instruments and discover new behaviors in themselves. RICHARD ALAN NICHOLS is an actor, teacher, and director. He studied acting as a scholarship student for five years with Uta Hagen at the HB Studio in New York and has taught acting at Washington University, Park University, Avila University, and Rockhurst University. In 1985 he created his own studio, The Actor's Craft Studio, where he instructs beginning, intermediate, and advanced actors. Nichols' stage credits include: Nonno in The Night of the Iguana (Metropolitan Ensemble Theatre), the title role in The Giver (The Coterie), Moris in Permanent Collection (Unicorn Theatre), Morrie in Tuesdays with Morrie (American Heartland Theatre), Harry in The Sum of Us (Actors & Artists Against AIDS), Dorn in The Seagull (Missouri Repertory Theatre), and many more. His film credits include: James Ivory's Mr. and Mrs. Bridge, Steven Soderbergh's King of the Hill, and the TV movie They've Taken Our Children. Nichols has directed Jesus on Toast (KC Fringe Festival), You Can't Take It With You (Rockhurst University), Anna in the Tropics (Johnson County CC), Reckless (Unicorn Theatre), The Woolgatherer (Park University), and many more. He is the author of two plays: Land and Detours. Nichols resides with his partner, set and costume designer Atif Rome, in Kansas City, Missouri.